Bella is still sleeping through the night with clonodine. She did some sleep talking last night, but nothing that disturbed either of us. We had our second attempt at an upper GI this morning. This time Courtney from child life went with us. It took some serious encouragement to get Bella to lie down on the table. The radiologist and his assistant told us to give up twice. They more or less told us this isn’t going to work, but Courtney just smiled at them and continued coaching Bella. She was great! I had given up hope myself, when finally, Courtney gently pushed Bella down from sitting position to lying on the table and she stayed there. Bella asked me to taste the grape flavored juice (barium) before she would try it. It was actually not bad. It tasted like grape flavored tylenol. Bella drank it like a champ. The doctor’s were right. Bella does have reflux! We have asked her several times if she has any of the symptoms, and she always says no. They want me to follow up with ENT at home. They want him to look closely at her vocal chords, her tonsils and adenoids. Her tonsils are always huge and could be contributing to the problem. If the ENT says they are not, we are to follow up with a gastroenterologist. After the GI, Bella got to get a special prize from Courtney’s office. It was a huge Barbie Glam Bedroom set. I don’t know how I am going to pack all the prizes this kid has earned! Once back on the pediatric floor, the doctors checked Bella’s skin and said to continue baths and wraps as we have been (2 baths per day, Morning = vanicream on body and protopic on hands and feet with dry wraps/clothes/socks. Evening = Vanicream on body with dry wraps/clothes and steroids and wet socks on hands and feet). After meeting with the doctors, she went straight to the tub. After the bath, we started the baked egg challenge. The egg was baked into a muffin/cupcake just like the baked milk challenge. She is served a little bit at a time all day long. She passed!!! In case you didn’t get that, she passed wheat, baked milk and baked egg! 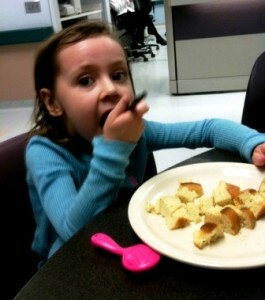 That means she can eat most “normal” baked foods! Tonight she ate a hot dog that volunteers grilled with a bun! While Bella was working on her food challenge, I had parent group therapy. The theme was hopes and fears. All of the other parents were new to the program. I tell you, I have so much to be thankful for. These kids have many more problems than Bella. There wasn’t a dry eye in the room. Tomorrow we will challenge non-baked egg. I wasn’t sure if she’d like scrambled eggs, so she will eat it in the form of French toast. Yum! Oh, so thankful for all the help you’ve received there! Love reading your story. Wow, her diet is really opening up! What a blessing! Hi, We also overcame severe eczema, but now my other child is having night terrors… that is somehow how I found your blog. Anyway, I was surprised to see the part here about the raspy voice and big tonsils– my child who had eczema also has both. Any verdict from doctors on that? Also, do you use Cerave at all? After 2 years of head to toe eczema we found Cerave and Dermasilk garments, and it changed our lives. Thanks! Btw, our allergy saga also began with a cashew nut allergy, which is so strange since I ate them like crazy when I was pregnant with him.